Abstract: Change analysis and detection plays important role in the updating of multi-scale databases.When overlap an updated larger-scale dataset and a to-be-updated smaller-scale dataset, people usually focus on temporal changes caused by the evolution of spatial entities.Little attention is paid to the representation changes influenced by map generalization.Using polygonal building data as an example, this study examines the changes from different perspectives, such as the reasons for their occurrence, their performance format.Based on this knowledge, we employ decision tree in field of machine learning to establish a change detection model.The aim of the proposed model is to distinguish temporal changes that need to be applied as updates to the smaller-scale dataset from representation changes.The proposed method is validated through tests using real-world building data from Guangzhou city.The experimental results show the overall precision of change detection is more than 90%, which indicates our method is effective to identify changed objects. FRITSCH D. GIS Data Revision-visions and Reality[R]. Keynote Speech in Joint ISPRS Commission Workshop on Dynamic and Multi-Dimensional GIS. Beijing: NGCC, 1999. 陈军, 王东华, 商瑶玲, 等. 国家1:50000数据库更新工程总体设计研究与技术创新[J]. 测绘学报, 2010, 39(1): 7–10. CHEN Jun, WANG Donghua, SHANG Yaoling, et al. Master Design and Technical Development for National 1:50 000 Topographic Database Updating Engineering in China[J]. Acta Geodaetica et Cartographica Sinica, 2010, 39(1): 7–10. KILPELÄINEN T, SARJAKOSKI T. Incremental Generalization for Multiple Representations of Geographic Objects[M]//MULLER J C, LAGRANGE J P, WEIBEL R. GIS and Generalization. London: Taylor & Francis, 1995: 209-218. HAUNERT J H, SESTER M. Propagating Updates between Linked Datasets of Different Scales[C]//Proceedings of the XXⅡ International Cartographic Conference. A Coruña, Spain: ICC, 2005. DEVOGELE T, TREVISAN J, RAYNAL L. Building a Multi-scale database with Scale-transition Relationships[C]//Proceedings of the 7th International Symposium on Spatial Data Handling. London: Taylor & Francis, 1996: 337-351. 胡云岗, 陈军, 李志林, 等. 地图数据缩编更新的模式分类与选择[J]. 地理与地理信息科学, 2007, 23(4): 22–24. HU Yungang, CHEN Jun, LI Zhilin, et al. Study on Modes of Map Data Updating Based on Generalization[J]. Geography and Geo-information Science, 2007, 23(4): 22–24. 陈军, 林艳, 刘万增, 等. 面向更新的空间目标快照差分类与形式化描述[J]. 测绘学报, 2012, 41(1): 108–114. CHEN Jun, LIN Yan, LIU Wanzeng, et al. Formal Classification of Spatial Incremental Changes for Updating[J]. Acta Geodaetica et Cartographica Sinica, 2012, 41(1): 108–114. 张新长, 郭泰圣, 唐铁. 一种自适应的矢量数据增量更新方法研究[J]. 测绘学报, 2012, 41(4): 613–619. ZHANG Xinchang, GUO Taisheng, TANG Tie. An Adaptive Method for Incremental Updating of Vector Data[J]. Acta Geodaetica et Cartographica Sinica, 2012, 41(4): 613–619. 唐炉亮, 杨必胜, 徐开明. 基于线状图形相似性的道路数据变化检测[J]. 武汉大学学报(信息科学版), 2008, 33(4): 367–370. TANG Luliang, YANG Bisheng, XU Kaiming. The Road Data Change Detection Based on Linear Shape Similarity[J]. Geomatics and Information Science of Wuhan University, 2008, 33(4): 367–370. 林艳, 陈军, 刘万增, 等. 面状水系伪增量剔除的拓扑量化法[J]. 武汉大学学报(信息科学版), 2012, 37(12): 1504–1507. LIN Yan, CHEN Jun, LIU Wanzeng, et al. Topological Quantitatively Method for Spurious Increments Removed of Area Water[J]. Geomatics and Information Science of Wuhan University, 2012, 37(12): 1504–1507. 林艳, 陈军, 赵仁亮, 等. 顾及时空目标边界不一致性的增量识别计算[J]. 测绘学报, 2014, 43(4): 411–418. 简灿良, 赵彬彬, 王晓密, 等. 多尺度地图面目标变化分类、描述及判别[J]. 武汉大学学报(信息科学版), 2014, 39(8): 968–973. JIAN Canliang, ZHAO Binbin, WANG Xiaomi, et al. A Methodology of Change Classification, Formal Description and Identification between Corresponding Areas in Multi-scale Maps[J]. Geomatics and Information Science of Wuhan University, 2014, 39(8): 968–973. 杨敏, 艾廷华, 晏雄锋, 等. 叠置运算支持下的跨比例尺城区居民地数据变化发现与更新[J]. 测绘学报, 2016, 45(4): 466–474. 艾廷华, 郭仁忠. 基于格式塔识别原则挖掘空间分布模式[J]. 测绘学报, 2007, 36(3): 302–308. AI Tinghua, GUO Renzhong. Polygon Cluster Pattern Mining Based on Gestalt Principles[J]. Acta Geodaetica et Cartographica Sinica, 2007, 36(3): 302–308. 童小华, 邓愫愫, 史文中. 基于概率的地图实体匹配方法[J]. 测绘学报, 2007, 36(2): 210–217. 黄智深, 钱海忠, 郭敏, 等. 面状居民地匹配骨架线傅里叶变化方法[J]. 测绘学报, 2013, 42(6): 913–921, 928. HUANG Zhishen, QIAN Haizhong, GUO Min, et al. Matching Algorithm of Polygon Habitations Based on Their Skeleton-lines Using Fourier Transform[J]. Acta Geodaetica et Cartographica Sinica, 2013, 42(6): 913–921, 928. 赵东保, 盛业华. 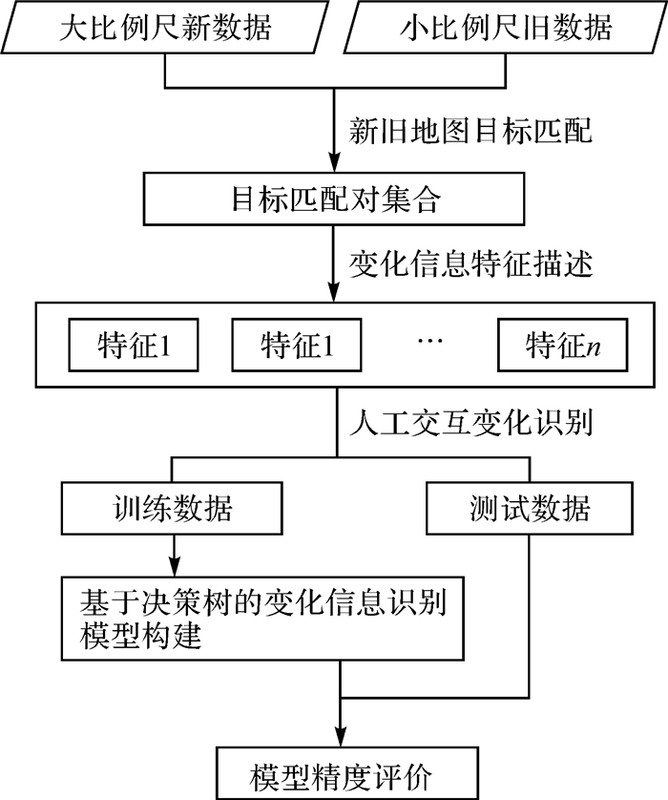 全局寻优的矢量道路网自动匹配方法研究[J]. 测绘学报, 2010, 39(4): 416–421. ZHAO Dongbao, SHENG Yehua. Research on Automatic Matching of Vector Road Networks Based on Global Optimization[J]. Acta Geodaetica et Cartographica Sinica, 2010, 39(4): 416–421. 张云菲, 杨必胜, 栾学晨. 利用概率松弛法的城市路网自动匹配[J]. 测绘学报, 2012, 41(6): 933–939. ZHANG Yunfei, YANG Bisheng, LUAN Xuechen. Automated Matching Urban Road Networks Using Probabilistic Relaxation[J]. Acta Geodaetica et Cartographica Sinica, 2012, 41(6): 933–939. 田文文, 朱欣焰, 呙维. 一种VGI矢量数据增量变化发现的多层次蔓延匹配算法[J]. 武汉大学学报(信息科学版), 2014, 39(8): 963–967, 973. TIAN Wenwen, ZHU Xinyan, GUO Wei. A VGI Vector Road Data Increment Distinguishing Research Based on Multilevel Spreading Algorithm[J]. Geomatics and Information Science of Wuhan University, 2014, 39(8): 963–967, 973. 田晶, 艾廷华, 丁绍军. 基于C4.5算法的道路网网格模式识别[J]. 测绘学报, 2012, 41(1): 121–126. TIAN Jing, AI Tinghua, DING Shaojun. Grid Pattern Recognition in Road Networks Based on C4.5 Algorithm[J]. Acta Geodaetica et Cartographica Sinica, 2012, 41(1): 121–126. QUINLAN J R. Induction of Decision Trees[J]. Machine Learning, 1986, 1(1): 81–106. QUINLAN J R. C4.5:Programs for Machine Learning[M]. San Francisco, CA, USA: Morgan Kaufmann Publishers Inc., 1993. BREIMAN L, FRIEDMAN J H, OLSHEN R A, et al. Classification and Regression Trees[M]. Belmont, CA, USA: Wadsworth, 1984.